Used for negative, positive and differential pressure applications, low pressure switches can be designed to function for liquid and/or gaseous materials. Low pressure switches are used in a wide range of industries including: the aviation industry, where they are essential for many hydraulic applications; chemical processing industries for sensitive material handling applications; laboratory or research industries for accurate testing; and wastewater systems for fast and efficient system control. Designed to actuate in response to minute, small and reduced pressure situations, low pressure switches react solely in direct correlation to the pressure of the system. Advantageous for systems such as pneumatic, plumbing, foam processing, sewer and steam, all of which can and often do operate at low pressures, low pressure switches can offer features such as explosion proof, adjustable and electronic in order to better fit the required application. 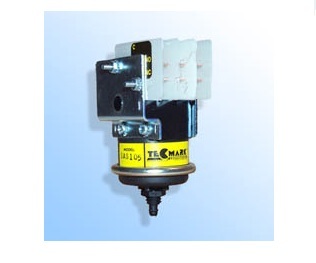 Low pressure switches are designed to regulate material flow within pressure systems. In order to be responsive to pressure changes, low pressure systems are constructed using materials such as diaphragms and sometimes piezoelectric crystals. Diaphragms respond to pressure fluctuation because when the flow exceeds the set point, the diaphragm will be pushed open and the medium will flow through. Piezoelectric crystals respond to pressure changes because when they are pressed or released, they produce a voltage that is used to actuate the switch. There are three main types of low pressure switches: negative, positive and differential. Negative low pressure switches function by converting the negative pressure signal to an electrical output; thus the switch is designed to respond only changes in the negative pressure chamber. Positive low pressure switches function in much the same way; essentially, they work by converting the positive pressure signal to an electrical output, thus only responding to changes in the positive pressure chamber. Differential low pressure switches, however, function in a significantly different manner. These switches work by measuring or regulating between two points of differing pressure and actuate based on a set point. Differential low pressure switches are extremely sensitive to any changes in pressure, no matter if the pressure is negative or positive. Low Pressure Switches Low pressure switches, also referred to as light pressure switches, are used to sense changes in hydraulic or pneumatic input pressure, specifically if the pressure falls below or rises above the set pressure point, and to respond by making electrical contact, either through switching on or off.